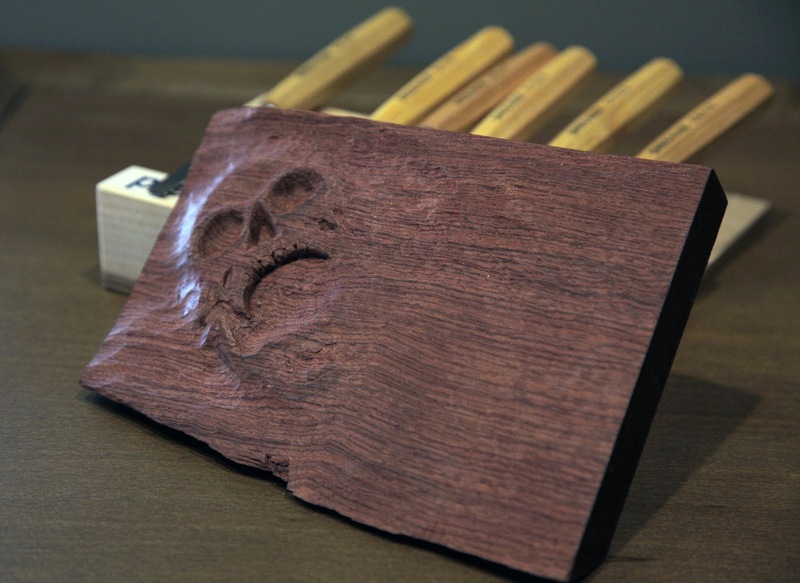 Several months ago, a trip to my local woodworking tool retailer resulted in me spending some money on a set of wood carving tools. Don't worry, I paid with a credit card so that my purchase could be tracked by that bored agent. I have been wanting to try to carve a ball and claw foot since I sat in a class given by Ms. Mary May at the Woodworking In America conference in 2012 (photos above). If you have a chance to take a class with her, or are up to ordering one of her DVDs I would recommend you do so. She is an excellent teacher and has an amazing amount of skill. 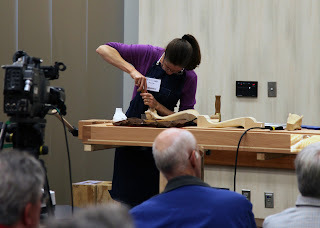 During the class, she made it a point to mention that she didn't start with many carving tools and that, like many other tools, experimenting with the tools opens many avenues to skill and creative solutions. So, I thought, I'll start small (I always tell myself that but it never ends well). 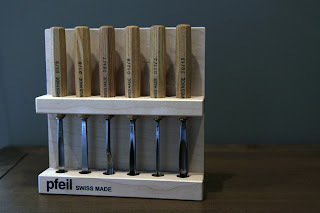 The set of carving tools I purchased are made by Pfeil and came as a set of six different tools. Pfeil offers several variations of the set, each with a different six tools. I purchased the one that looked like it had the most variety, partly because I had no idea what I was really looking for. This turned out to be a good decision...at least I think it turned out to be a good decision. 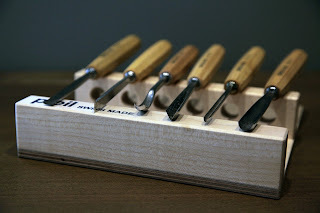 Not being one of those people with "patience" when it comes to testing out a new tool, I got the set home, grabbed a scrap piece of wood, and started hacking. I have been working with this set of tools on occasion (not regularly) for the last several months and I must say I am very happy with my purchase. I feel like there is a lot I can do with these, they hold their edge very well, and they are comfortable in my hand. I like the octagonal handles as they don't tend to roll off the table and they are easy to grip. They have taken a beating from my poplar mallet and yet they are easy to guide with my hand through some rather tricky grained wood. I haven't tried the ball and claw foot yet, but I have managed to get my hands on a large piece of balsa wood which I plan to carve into a practice piece. Ms. May recommended a soft wood like balsa to practice in so I thought I'd give it a try after I have been relatively successful at hacking away some bubinga (a scrap from a saw tote I made a while ago). 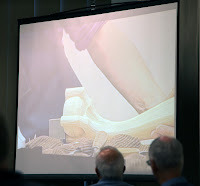 I am interested to see where learning to carve takes me, as it wasn't something I was terribly interested in until I gave it a try. I am certainly as green as it gets with respect to carving, but I do know a good tool when I use one, and I'd recommend this set of carving chisels to anyone interested in something like this. I plan to keep attempting to carve until I either really get the hang of it, or someone begs me to stop ruining wood. I have found that this is something that is really great at the end of a long day. Setup is minimal, I clamp the piece to my workbench and start, the mess is minimal (I have done some carving in my living room with a vacuum handy in case my wife walked in), and the tools required to get started were affordable and few in number. This seems like a really great way for someone with limited space and funds to get into working wood, something I am always on the lookout for.